The February meeting of the Central Mississippi Polymer Clay Guild will be on Saturday, February 17th, at 10:00 a.m. at the Pearl Library, Pearl, Mississippi. The focus of this meeting will be building a clock. We will review several techniques that you can use to design your clock. If you find a picture of one online that you like, print out a picture and bring it with you. Before you come to the meeting it would be a good idea to google polymer clay clocks. Get some ideas and gather some supplies for what you might like to make. 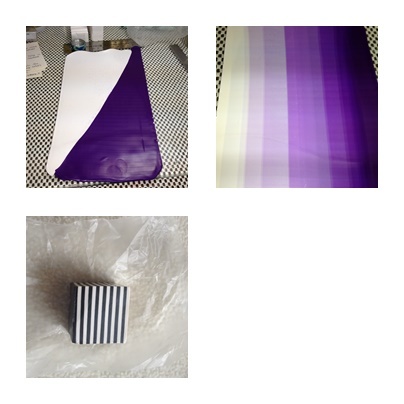 If you would like to put the clay on to a backing, you have several options. I've seen them on old CDs, on boards or on canvas. You do not need to do a backing, it's optional but you do need to decide and prepare before the meeting. For new (and old) members needing to build their skill set, we will be teaching a skinner blend which is one of the building blocks of many polymer clay projects. These can be as simple as 2 colors and as complicated as you'd like to go. For this exercise you will need 2 colors, one light and one dark. We normally show a color and white. You will be need a full block of white and one other color of your choice. Another basic skill we will demo is how to make a black and white stripe cane. Bring a full bar of black and of white. The third basic skill we will demo is a basic jelly roll. Bring 2 colors that you will enjoy working with. You could use this on your clock...so make sure colors coordinate if that is the case. something to put a hole in your clay to put the mechanism through, such as a small cookie cutter ( we have enough items to share for this) Arlene will bring a drill in case you decide to use a wood backing. Older members of the guild will be bringing extras with them to share. Please spend some time working with Polymer Clay before you start investing in items. Our website: www.cmspcg.com has a page you can find with what we have put in our toolboxes for meetings. It's a good idea to go thru that page and see what kind of stuff we tend to use. Of course we do not expect you to have any of it when you first start claying other then a tile to work on, an acrylic roller or pasta machine ( use your coupon of one of those from a craft store too), and a stiff blade_ 3 items always. We always ask that you bring a bar of black, of white and of translucent to every meeting. These are basics you almost always need to have on you. Suggestions for this meeting is Premo clay. The bar we refer to is 2 ounces. 2 colors for a jelly roll. Contrast is always nice in a jelly roll. If you are using clay as your backing for the clock, bring 2 colors of your choice. One color for the background and one for numbers at least. The sky is the limit here. Depending on your plans your color choices are your choice. Keep it simple or go crazy. If you have an idea for your clock and can't figure out how you would do that bring a picture of it and the guild will help you get there. All you need is the color clays you need to achieve it. Attached are a few attachments for you to get some ideas. 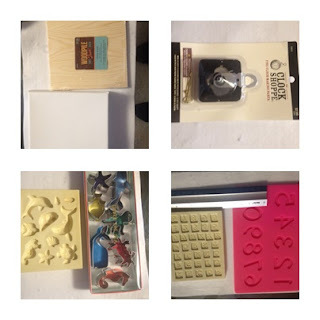 I will be bringing the molds shown here and the cookie cutters. All are welcome to use them. Remember once you use an item for polymer clay it should not go back for use with food.